Later, we walked and talked and became instant friends sharing confidences over the next year. Rose became a campus icon, easily making friends wherever she went and passing on jewels of wisdom through her experiences. At the end of the year, Rose was asked to speak to her fellow students. On the podium, she dropped her prepared speech and joked, ‘I’m so scared – I gave up wine for Lent and this whisky is killing me – so let me tell you what I know. We don’t stop playing because we’re old; we grow old because we stop playing. There are only four secrets to staying young – being happy; achieving success; laughing and finding humour every day, and remembering to have a dream, because when you lose your dreams – you die. We have so many people walking around who are dead and they don’t even know it. There’s huge difference between growing older and growing up. If you’re nineteen years old and lie in bed for a whole year and don’t produce anything, you’ll turn twenty-one, but if I, at eighty seven stay in bed for a year and never do anything, I’ll turn eighty-eight; anybody can grow older. It doesn’t take talent or ability. The idea is to grow up by always finding opportunity in change. Regret nothing. Shortly after gaining her degree, Rose died peacefully in her sleep. Over two thousand students attended her funeral wishing to pay tribute to a wonderful woman who taught by example that it’s never too late to be what you want to be, and achieve what you want to achieve. We are promised a safe landing, but not a calm passage. Growing older is mandatory; growing up is optional. We may make a living by what we get, but we make a life by what we give. If the Lord brings you to it, He’ll bring you through it. 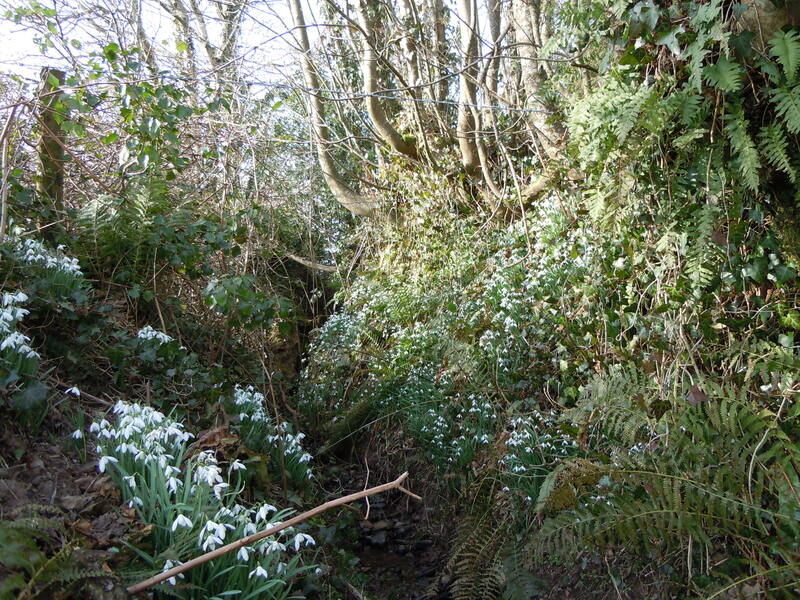 Driving along a small lane yesterday, I saw a sight that thrilled me; thousands of snowdrops lining a bank beside an almost hidden brook, and I was reminded of Rose and her story. Thanks for stopping by my blog. All the best to you and your views on life. 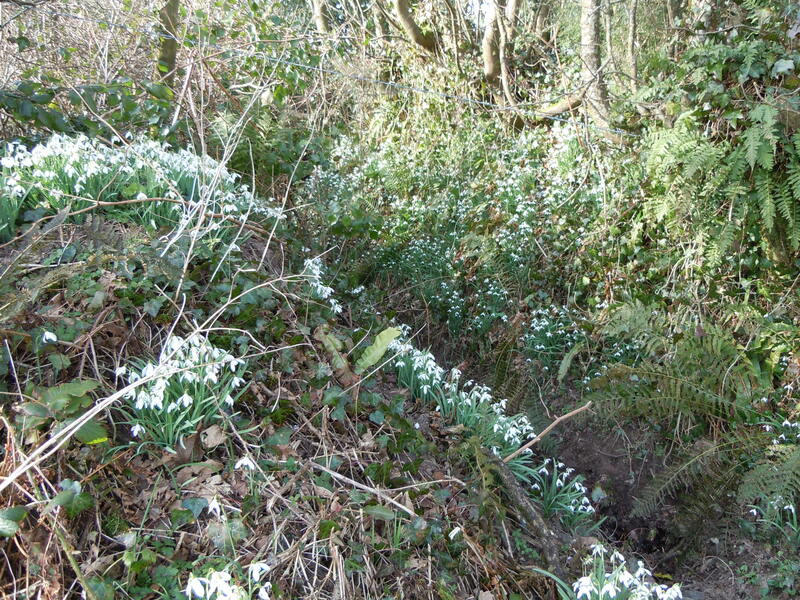 There is something about a snowdrop. I love to see them. The Roses of this world make you stop and think. After last Monday’s gales, hundreds of daffodils have been flattened here in my hill-top garden. Just wish a gentle wind would come from the other direction and help straighten them again.. Your title is my guiding philosophy — I have no plans for EVER growing up, but many plans for making the “growing older” part a lot more palatable. Your friend Rose sounds totally delightful — I wish I could have known her. I did have two grandmothers for inspiration, though — they both lived past 95 and enjoyed life all the way along despite heartaches and setbacks. It can be done! You are so right about making the ‘getting older’ more palatable, though looking at so much of today’s world, I sometimes find myself echoing the words of Maurice Chevalier’s song, ‘I’m so glad I’m not young anymore.’ The learning process can sometimes be hard, but when you’ve tucked a few decades under your waistline, those trivial matters seem just that – trivial. Life in the twilight years is too important to waste on worrying about what has been, or what might be – enjoy the best of your memories, and live for the moment. We have so much to be grateful for in the legacies left by those we have known whether for years or hours. Each enriches our present, and our future.. Thank you. I love reading yours too. I can empathise with Rose and you for repeating the story. The only thing is I disagree with her four things – achieving success is not required – after all being alive is more than enough – as long as you enjoy your life you have achieved all the success necessary. I am not sure about having a dream either – do you really need one – other than to enjoy the life you have? I do think she might have added ‘to keep learning’ – as when you stop learning your brain atrophies and you begin to die – and she was an excellent example of not permitting this! I’m at that stage where I did my time as a grown-up, now it’s back to childhood and doing what I want. So – I may be getting older, but…..
After an almost-fatal car accident at 34, I re-ordered my priorities and put them in proper order. It wasn’t until my 60th birthday that I realized that it doesn’t matter what others think of me. It only matters what the ones I love think of me. I decided then that I wanted no more regrets and no more missed opportunities. Life continues to excite me !!! I wish everyone could learn these lessons by the time they are 21. I believe their lives would be so much more interesting. It would help us not to make some of those mistakes that make us squirm in later life, but then it’s impossible to put that older head of sixty years on to the shoulders of a twenty-one-year old. Thank you. I’m glad you enjoyed reading it. Superb writeup. Growing old is nothing unique everybody does that; very few grow up. Really very nice idea everybody should follow – at any age! Glad you feel the same way. Thanks for dropping by. It is a fact. On physiological growth we have got no control but we’ve the option of ‘growing up’ and act accordingly. Acquiring age hardly means acquiring wisdom. Thanks sharing madam. I have found that as I have grown older, my thirst for knowledge has grown too. I’m beginning to feel like a proverbial sponge; the more I soak up, the greater my capacity and the enjoyment of adding to the store. Thank you for sharing Rose with us, this struck me and rings so true, ” We don’t stop playing because we’re old; we grow old because we stop playing. There are only four secrets to staying young – being happy; achieving success; laughing and finding humour every day, and remembering to have a dream, because when you lose your dreams – you die. We have so many people walking around who are dead and they don’t even know it. This I will take home with me in my heart today, “We are promised a safe landing, but not a calm passage. Growing older is mandatory; growing up is optional. We may make a living by what we get, but we make a life by what we give. If the Lord brings you to it, He’ll bring you through it.” I turned 44 yesterday. Turning 44 was mandatory, feeling and living 44 is optional. Age is but a number, how feel and live our days is what matters. I wish to feel and live like my 9-year old. For as long as I stare in his eyes, embrace that childhood innocence and share that child-like goodness, kindness and love around…I know I will always carry that inner joyful, care free, adventurous youth within me no matter how many wrinkles and grey hair I already have. God bless you and your family. thanks for this wonderful post. It’s funny how a chance meeting or even the reading of a short story or article can make you pause, even stop and think. That brief encounter with fate can often enrich your life so that it will never be the same again. So true. Lovely, inspiring post. I came across another post and loved this Maureen , what a wonderful woman Rose was. In the intervening years, I have had reason to remember those word of wisdom.